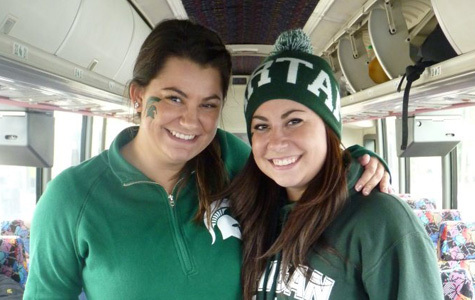 U of M/MSU Party Bus – Detroit’s Best Party Bus Experience! between these Big 10 Rivals! 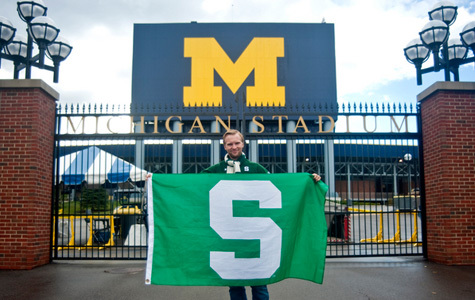 Season between MSU & Michigan! Labatt Blue Light & Tito’s Handmade Vodka Cocktails Compliments of The Social Connection, pop, water, party jams and restrooms on the bus! BYOB? Absolutely! You can also bring your favorite beverages with you! 2009-2018 – All Buses Sold Out – Make Sure You Don’t Miss The Bus! 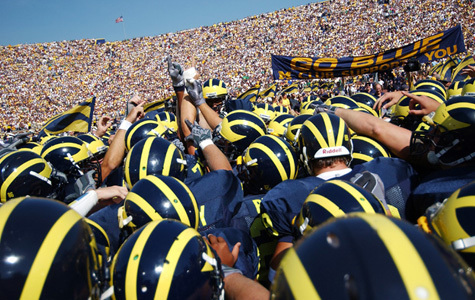 Grab your Friends for this party – mingle with thousands of other college football fans! 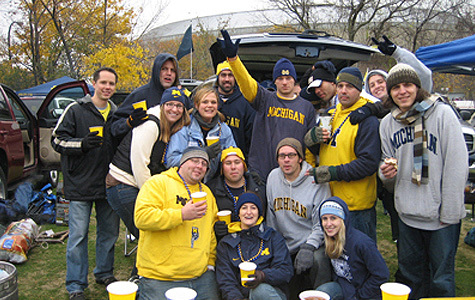 Guests are welcome to wander Downtown Ann Arbor and visit all of your favorite bars & pubs or around campus or hit all of the tailgate parties around campus to meet up with friends or make new ones! *NOTE: Buses will begin to return when full at the end of the game. 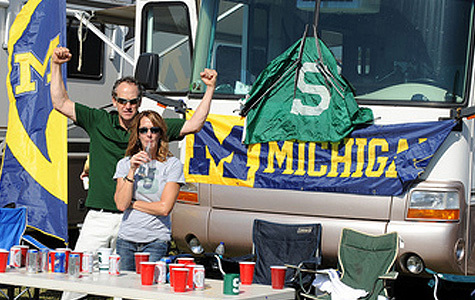 The LAST BUS RETURNS FROM Ann Arbor EXACTLY 1 HOUR AFTER THE GAME ENDS! *Maps with drop-off, stadium area and pick up locations will be provided. 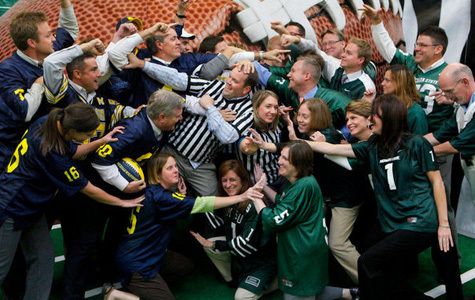 Every year we bus 500 College football fans to the BIG game, everyone gets home safely! Allowing for 8 HOURS of Tailgating & Bar Hopping Fun! Don’t have tickets to the game? No worries – many of our riders don’t! Whether you are catching up with friends at tailgate parties or just coming along for the ride, there are dozens of bars and options for watching the game. If you are the social organizer and have a large entourage you want to bring with you or are planning a special event please call us to set up a group name. As the group leader, if you have over 10 in your group you can go for free! The Social Connection is seeking volunteers to help with checking guest in at the registration location and help pass drinks out on the buses. – All while cheering on your favorite team. 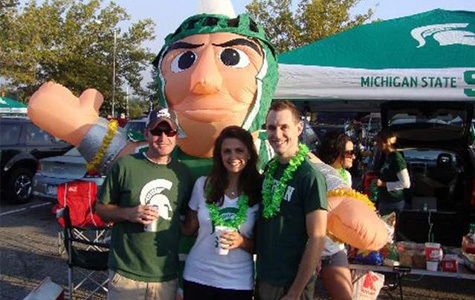 It’s an easy fun ride to East Lansing and your drinks are included too! Tickets are transferable – If you re unable to attend you can give or sell your tickets to a friend. The printable bar coded tickets can be given or emailed to a friend. Tickets can be redeemed at check-in on your smart phone. Upon purchase your event tickets will be sent to the purchaser’s email address. All of the tickets will be in the PURCHASERS NAME. Email confirmations will be sent within 48 hours of the event date with parking, departure and other details regarding the event. Watch your inbox!